Panama Canal: The wonderful wildlife you need to see! The Wildlife of the Panama Canal is a stunning surprise for all visitors to this enticing country. Surprised to learn that one of the world’s most impressive feat of engineering is home to a plethora of amazing creatures? You shouldn’t be. This is Latin America, after all! Panama Canal. Photo credit: Shutterstock. Ever since the Panama Canal was inaugurated in 1914, people have yearned to cross it. No wonder. Besides the logistical bonus of cutting out thousands of nautical miles on a west to east journey of the Americas, the Panama Canal is still considered one of the most advanced engineering marvels ever constructed, even a century after works were completed. Yet nowadays, aside from the exciting prospect of simply navigating through it, a crossing of the Panama Canal offers the enviable chance of wildlife spotting. The canal is part of the Panama Canal Watershed, an extensive biodiverse nature reserve, home to thriving colonies of creatures, including hundreds of reptiles, amphibians and a fantastical number of birds. 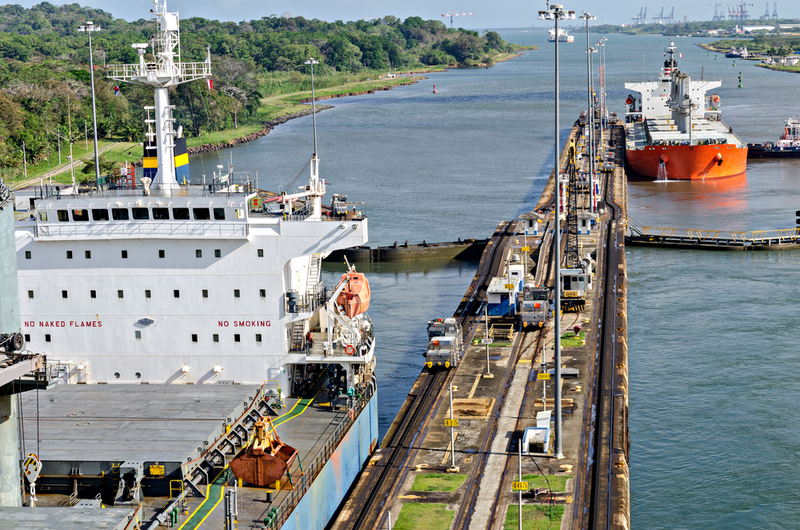 Think a crossing of the Panama Canal is all boats and locks? Think again! Combine a wildlife outing with your Costa Rica and Panama trip and you’ll come face to face with some of the most enticing Wildlife of the Panama Canal. Bradypus sloths. Photo credit: Shutterstock. Three sloth species live and thrive in Panama and this country is often regarded as the best in Latin America to spot the easily camouflaged curious creature. 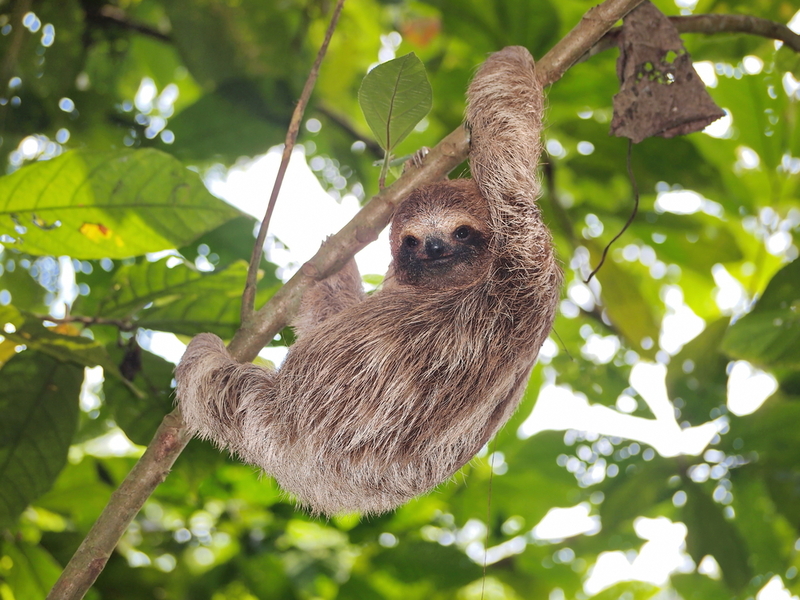 The Pygmy sloth is only found in a very restricted area of Panama and is arguably the rarest of its kind, yet on a wildlife tour of Panama, you’ll still have a great chance of seeing the Bradypus or brown-throated three-toed sloth. The Bradypus is about the size of a large cat, with its distinctive long arm, beady eyes and seemingly perpetual smile. Sloths spend the great majority of their time (and life) just chillaxing on a comfortable nook of a tree branch, descending about once a week to relieve themselves. Geoffroy’s spider monkeys. Photo credit: Shutterstock. The black-handed spider monkey is one of several species of primates living in the lush tropical jungles framing the Panama Canal. 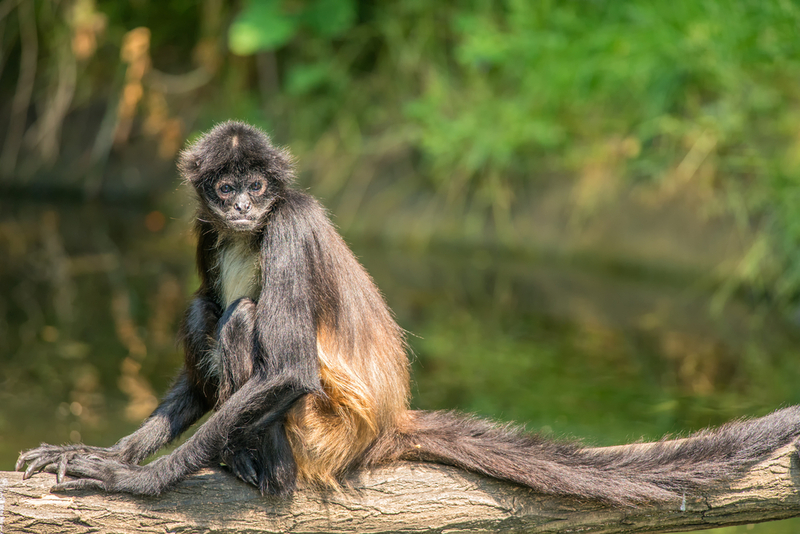 An endangered species due to habitat loss and hunting, Geoffroy’s spider monkey is a daily feeder and comes to ground much more often than his fellow primates, so you’ll have a pretty good chance of spotting one when you visit. Panamanian Tamarins. Photo credit: Shutterstock. This small black and white monkey thrives in groups of 5-10 mates and is arguably the most common primate to live along the Panama Canal. Part of the same family as the Geoffroy’s spider-monkey, the Panamanian Tamarin is found only in Panama and Colombia yet it’s significantly shorter gestation period means numbers are flourishing in both countries. Curiously enough, the tamarin thrives best in secondary forests, so in areas of moderate human population – where primary forest has been cut down for agricultural purposes – the Panamanian Tamarin can survive rather nicely. Panama is home to almost a dozen different species of nocturnal monkeys, all of them exhibiting adorable large round eyes which aid their night vision. So elusive is this particular creature that their exact number is actually unknown. Want to spot? Then pack a keen eye and book an overnight stay in a Panama Canal jungle lodge. Blue-footed boobys. Photo credit: Shutterstock. From the dramatic volcanic islands of the Galapagos to the lush tropical canopies of Panama, the Blue-Footed Booby enjoys quite the vagabonding. 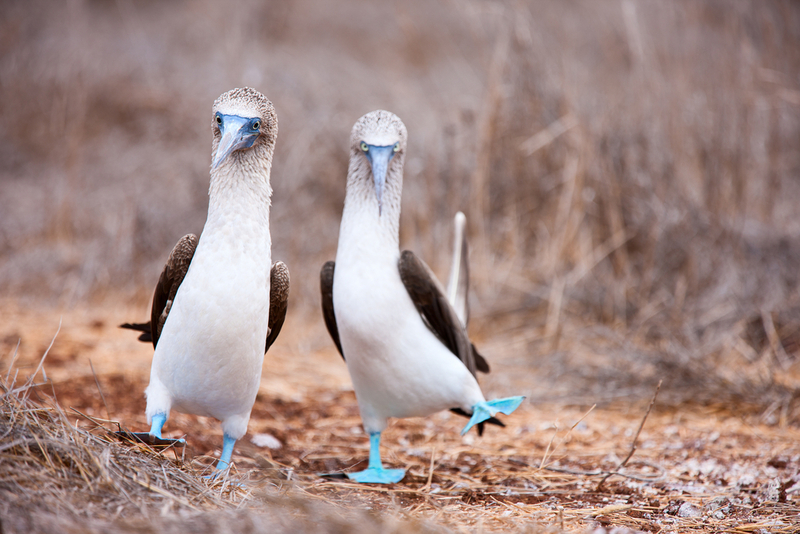 Although arguably the most famous bird to live in the Galapagos Islands, the Blue Footed Booby is not actually endemic to the area (although over 50% of pairs prefer to mate there) and can be spotted in several areas of the Americas. Regarded as ‘lords of the dance’, male Boobies love nothing more than to show off their feet when wooing females. White-headed capuchin. Photo credit: Shutterstock. The mono cariblanco is a cute little fella and arguably one of the most intelligent of his species. Capuchins are resourceful (cracking hardy nuts with rocks if need be) and even known to barter for food or favours. They prefer the lowland forests of Panama and Costa Rica although have a wide ranging habitat which spans from Colombia to Belize. 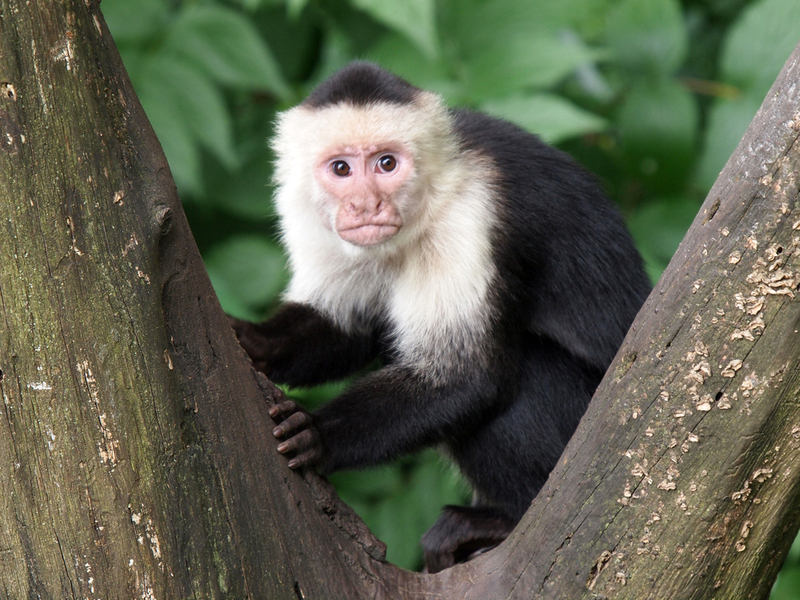 Small and agile, they white-headed capuchin has a black body, white face and chest, and small black ‘cap’ atop its head. 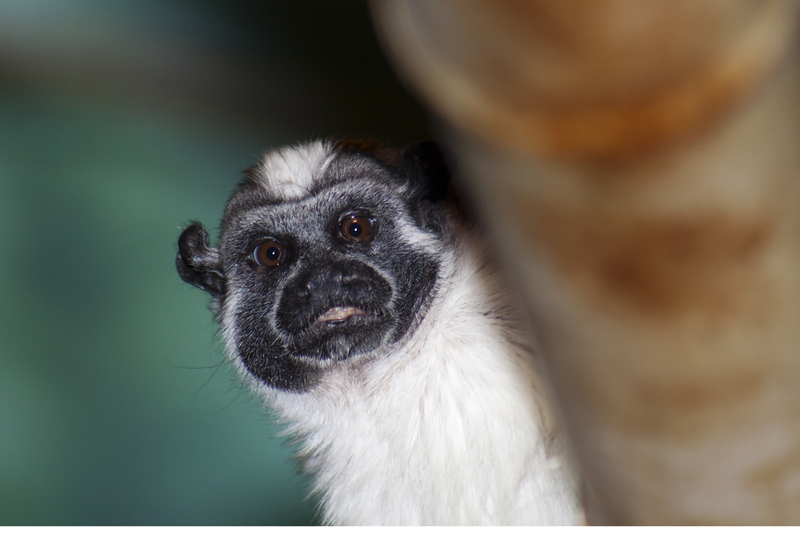 Their eerie resemblance to Capuchin Friars is what led the Spanish conquistadores to name the species. Green Iguana. Photo credit: Shutterstock. 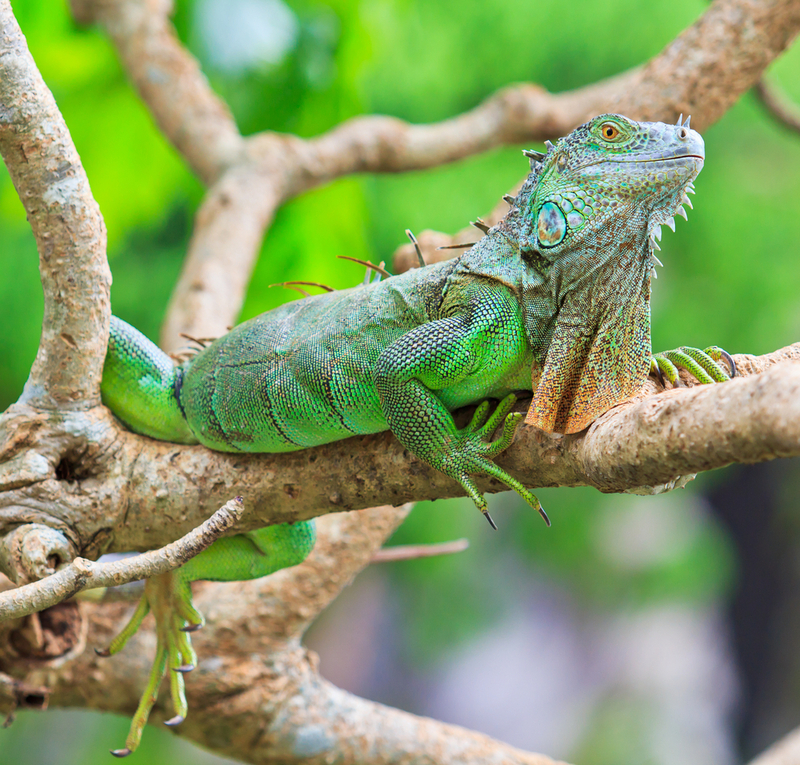 With their threatening spikes and super-lightening speeds, the green iguana is one of the scarier-looking reptiles of the Panama Canal, yet their docile and calm demeanour, and their avid avoidance of conflict make them a popular ‘exotic pet’ in the USA. Unfortunately, green iguanas don’t adopt well to captive life and are one of the rare animals which actually live much longer in the wild (up to 20 years) than in someone’s home tank (about 2 years for most). At home in the forests of Panama, the green iguana spends most of its day chomping on flowers and plants (an inherent herbivore) and is one of the most often-seen wildlife species in the region. Capybaras . Photo credit: Shutterstock. Living and foraging along the banks of the Chagres River, the largest (and cutest) rodent on our planet is a gregarious chap that survives as well in lowland jungle-beds as he does at heights of up to 1,500. There are two different types of Capybaras in Latin America and Panama is home to both. 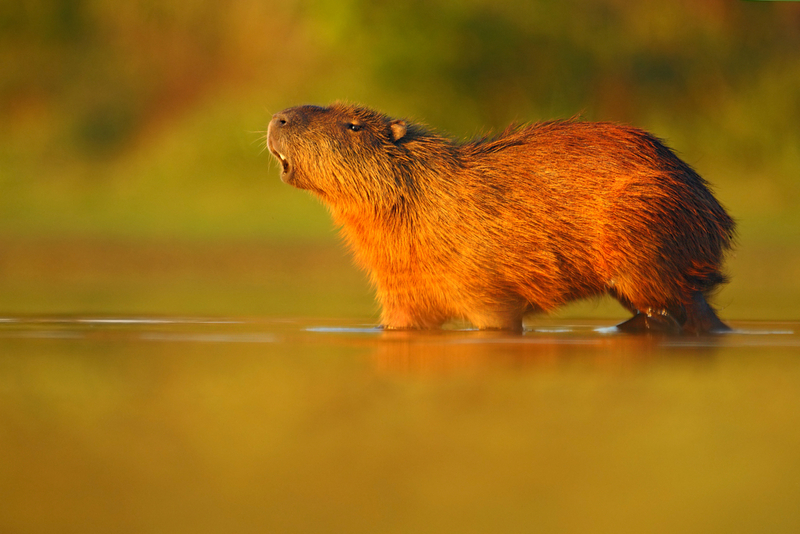 Along the shores of the Panama Canal is where you have the chance to spot the Lesser Capybara, the rarer of the two. Adult – both males and females – can reach a weight of 50kg and height of about half a metre. Only semi-aquatic, the capybara needs water to survive and is a very agile swimmer thanks to its webbed feet, although it spends most of its time hanging about the shores of rivers and lakes. 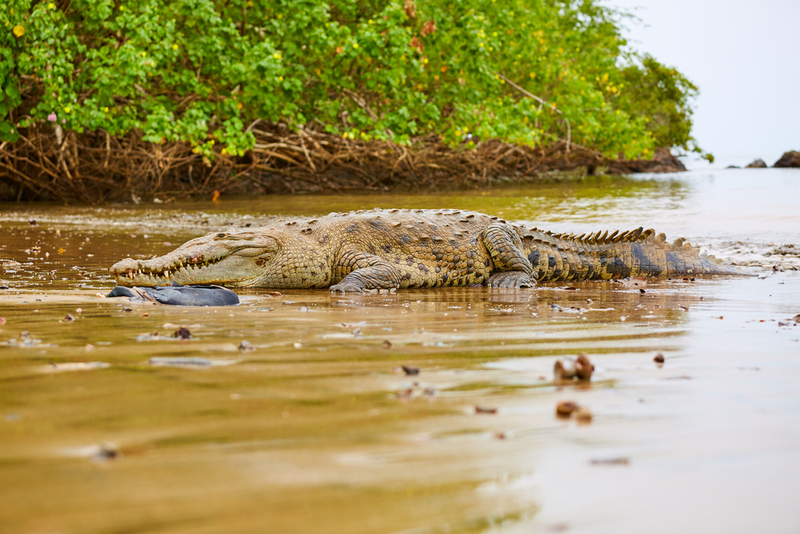 Small caimans and large crocodiles are most often seen at mouths of rivers, where fresh waters flow freely into the sea. Swimming in the Panama Canal is not recommended, and these pesky predators are the only real reason you should wait until you’re in the balmy waters off the coastline of Panama, before diving in. The caymans and crocodiles of the Panama Canal are, along with rare and elusive jaguars, the largest and fiercest predators of all. The West Indian Manatee if one of rarest Wildlife of the Panama Canal and a subject of much conservation over the last two decades. 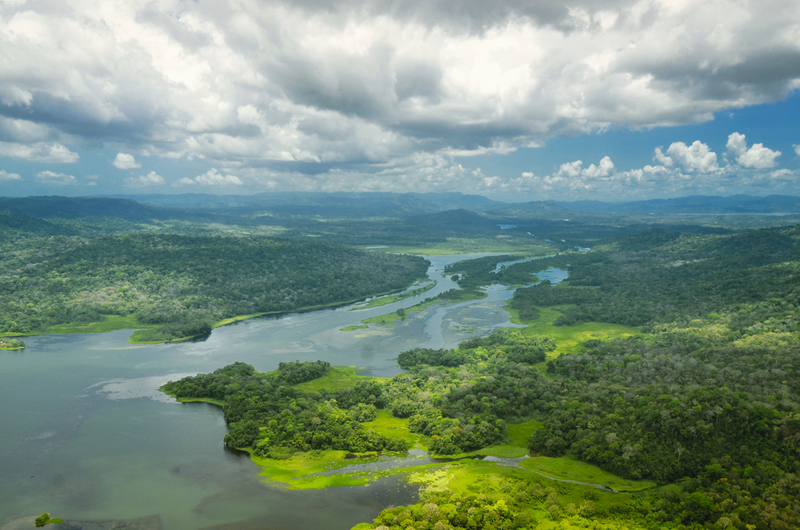 Although a sighting on Lake Gatun (the freshwater lake that feeds into the Panama Canal) is not a too-common event, your best bet for a sighting is to include a jungle boat trip along the canal and into the lake. 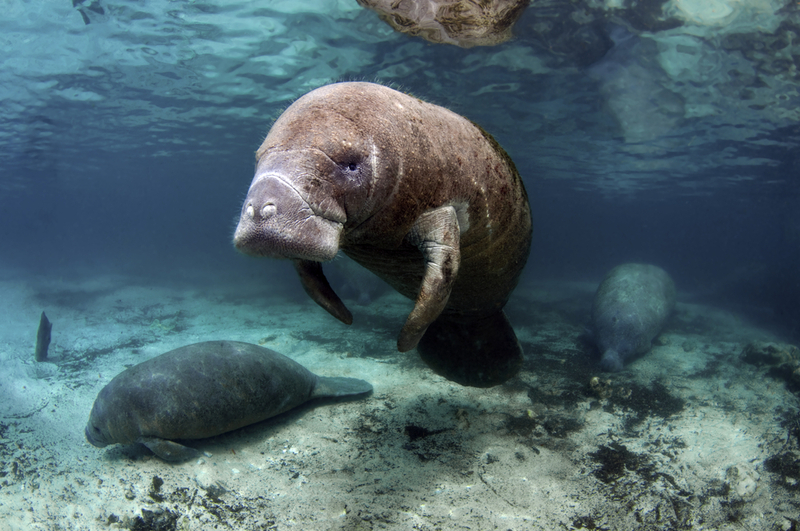 Manatees were first introduced to the lake in 1964 in an attempt to facilitate vegetation growth in the area. Bird and nature lovers will be infinitely rewarded by an early morning visit to the Panama Rainforest Discovery Centre and, in fact, both in and outside of Panama City, there are quite a few animal protection reserves you could visit. Easily combined with a phenomenal crossing of the canal, a tour of the Wildlife of the Panama Canal is a fantastic way to experience a feat of man and a feast of nature. At Chimu Adventures, we’ll show you how the very best secrets hidden in the heart of this enticing treasure trove of culture and nature, and help plan your next utterly unforgettable adventure in Central America.